Synergy is a wholly cloud-based application that lets you manage your business and projects on the go. With this application, you can access organizational information and work on them via a web browser. This way, you can be productive regardless of your location. 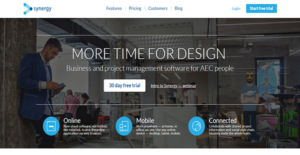 With Synergy, you can streamline your AEC business needs as well, beginning with time tracking. Instead of relying on spreadsheets all the time, you can switch to timesheets for more accurate figures. On top of that, this can aid you in sending invoices to clients with the correct information to avoid hassles and delays in payment processing. Moreover, Synergy enables you to collaborate and share with colleagues wherever you are. The application has social-like messaging features for you to connect with your team around the clock. For your business to be profitable and not just afloat, it is imperative that you understand how profitable potential projects can be. Synergy gives you the tools for job costing to ensure that projects are progressing as planned and that it does not go beyond the set budget. Additionally, Synergy affords you the ability to connect the application with popular accounting software like Xero and QuickBooks online. This connectivity allows you to streamline your finances and ease the burdens of your accounting team. With Synergy, your work processes can flow smoothly as all information everyone on your team needs to work is stored in a central repository. This lets them access documents and contacts anytime and thus prevent workflow bottlenecks. Furthermore, Synergy allows you to give your team access to the latest iterations of documents and files. This helps avoid confusion and makes certain that everyone is on the same page. Synergy has what it calls project portals where every digital paraphernalia related to certain projects are stored. These allow you to securely disseminate and access information to enable you and your team to engage with the project anytime. Moreover, you can also give your clients access to project files. But only to those that you have made available to them. This way, you can keep them updated on your progress without divulging additional information. Using spreadsheets for time tracking is outdated. With Synergy, you can accurately keep track of time spent on projects as the application has a timesheet. This tool allows you to send invoices to clients with the correct information at the end of the project. By providing them with accurate billing hours, you ensure their satisfaction and you raise your chances of working with them again. If you are considering Synergy it could also be beneficial to examine other subcategories of Best Architecture Software listed in our base of SaaS software reviews. Each enterprise has different needs and needs an application that can be customized for their size, type of staff members and customers, and the specific industry they are in. For these reasons, no platform can offer perfect functionality off-the-shelf. When you look for a software product, first be sure what you need it for. Read some Synergy reviews and ask yourself do you need basic tools or do you need complex features? Are there any industry-specific features that you are searching for? Obtain the answers to these queries to help your search. There are multiple elements that you need to reflect on and these include your finances, particular business needs, your company size, integration requirements etc. Take your time, use a few free trials, and finally select the system that provides all that you require to boost your company efficiency and productivity. How Much Does Synergy Cost? Synergy has three enterprise pricing plans. The prices and inclusions are indicated below to help you decide on the package that meets your needs best. We realize that when you make a decision to buy Architecture Software it’s important not only to see how experts evaluate it in their reviews, but also to find out if the real people and companies that buy it are actually satisfied with the product. That’s why we’ve created our behavior-based Customer Satisfaction Algorithm™ that gathers customer reviews, comments and Synergy reviews across a wide range of social media sites. The data is then presented in an easy to digest form showing how many people had positive and negative experience with Synergy. With that information at hand you should be equipped to make an informed buying decision that you won’t regret. What are Synergy pricing details? What integrations are available for Synergy? Synergy also has an open API that you can employ for connecting the software with more products. If you need more information about Synergy or you simply have a question let us know what you need and we’ll forward your request directly to the vendor.